My person said that I can't play with the sheep yet. Sooo, Goose, will do. I'm allowed to visit the sheep as long as I stay quiet. Busta's Rimrock Larkspur is a daughter of Deep Creek's Bubba and Rimrock Rimfire Dally. She was born June 1, 2012, and arrived on Harris Ridge in early August, 2012. 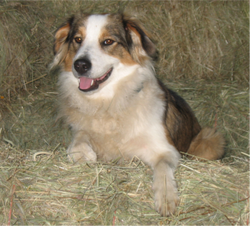 She gets along great with Tank, was easy to housebreak, is friendly with new people and dogs, and at six months, has started showing an interest in both sheep and cattle. I got Lark with the intent of breeding her in the future, assuming she grows up to be a good representative of the breed. So far, she is doing great! She has a lot of energy, learned the household rules quickly, and is very interested in my new sheep, but is also biddable and not aggressive with them. She will probably mature to about the size of her mother - around 50 pounds and 20" tall. She has good bone structure, and is a stocky dog. PennHIP .52/.46, about average for English Shepherds. 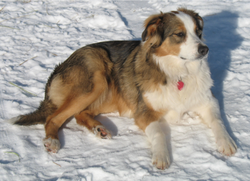 Lark is registered with the English Shepherd Club Registry. Lark is also registered with the UKC. Her sire is Deep Creek's Bubba. Her dam is Rimrock Rimfire Dally from Carol Greet in Wyoming. Lark has been working our sheep. Doing a good job and really seems to be loving it. She works quietly and listens to commands. This is Lark at seven months old. She and Tank are learning how to move their sheep. They both are doing a good job at commands. I have been blessed with a friend who is a dog trainer and he is helping us learn to do the job right. Mostly me. The dogs come by it naturally. Lark holding sheep. She is so quick to learn. Lark working sheep at 8 months old. Lark at one year old. She loves to help me with haying. Lark has been working sheep in a quiet and steady manner. helps put the chickens in their pen at night. This is Lark at six months old.